Happy Tuesday! Today on the blog I've got these boozy, decadent little dark and stormy date caramels inspired by this recipe from Amanda Paa. They're the perfect combo of heat + zesty aroma + swoon-worthy booziness. And chocolate. ALL THE CHOCOLATE. Definitely a winner for date night (or Valentines / Galentines day *wink wink*). Are we all recovered from our national religious holiday aka The Superbowl? I don't know about you guys but I ate a massive portion of nachos (organic chips + local salsa + roasted green chilis + black beans + tahini drizzle + garlicky guac + chèvre!). I feel it's my duty, as an American, to go hard on some nosh for Superbowl Sunday. I basically unhinged my jaw for the evening. Also you guys I subbed a kombucha tonic for beer. Yep. 100% granola up in here. But I feel pretty good about it. Especially since I shared a hella strong rum cocktail for my friends b-day this past weekend. You know when a drink is so strong and sweet it tastes like a color? Well... I definitely slurped on some turquoise this past weekend. But! All that aside. Read on for the better (lightly) boozy treat you should most def make for your sweetheart / bff for v-day this year! I first made these date caramels during the blizzard. I was snowed in with Logan and two of my friends. After an attempt at frolicking through the snow drifts (and a quick portrait session where my fingers went numb) we resigned ourselves to huddling indoors near the fire. We set our soggy, frozen socks and hats and gloves on the wood pile to dry out. And I made treats. Because frozen peeps + low blood sugar = a sad, sloppy situation. There's nothing quite like a chocolate treat in a snow storm. I mean, chocolate is heart opening, bliss inducing magic. And ginger is one of my favorite panaceas. I love it's soothing heat and fiery flavor. 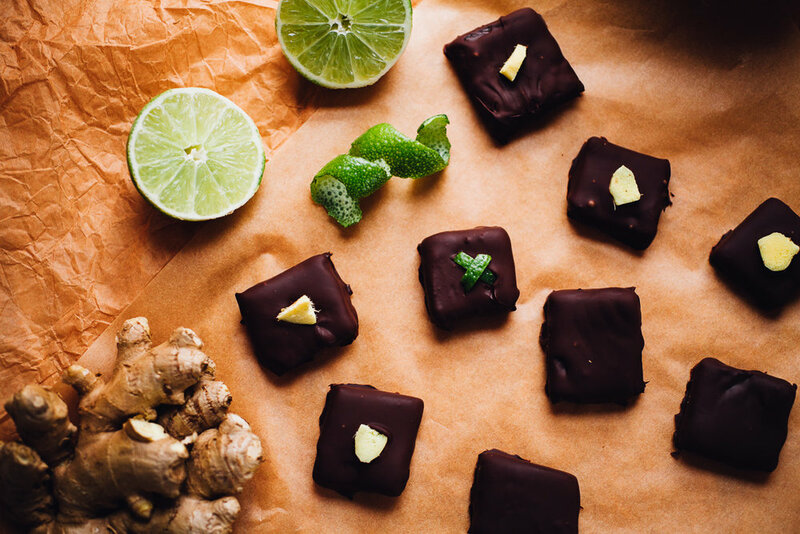 Salted chocolate date caramels + ginger... now that's some delicious medicine right there. The first time I made these bad boys I juiced fresh ginger into the date caramel centers and then topped each chocolate enrobed caramel off with a bit of minced ginger. In my mind, these treats totally set us up for a happy, chill, cozy weekend. Despite being trapped in a snow globe. We wrapped ourselves in blankets, had a group meditation sesh and chilled hard. Nothing like a snow day to force you to stop, drop and nap. After that initial conversion of ginger and date caramel goodness, I couldn't get the flavor combination out of my head. Ginger + dates + salt + chocolate. Too goddam good. I was set to make it again, not for the blog particularly. Just for me and Logan. Maybe for a date-night-in (imagine: dancing in the living room to jazz on vinyl after noshing on mole tacos). But of course, during a brainstorm a week later, it came to me: dark and stormy date caramels! With rum and lime! Of course! So I whipped them up immediately, for no occasion. Other than celebrating a life permeated with wonderfully squishy love feels. Maybe that. The flavor combination in these date caramels is heavenly, especially if you're a fan of dark and stormy cocktails. Heavy dark rum, fiery ginger and aromatic lime make these easy, clean-eating caramels complex and fabulous. Perfect for a date night in or an easy cocktail party. You'll want to use a good quality dark rum, something that has a pure flavor as it really comes out in the caramels. I used a Virginia-made dark rum crafted in a traditional Caribbean style. Obviously, these are for grown-ups only. Leave the rum out if you're sharing them with children. Adapted from [url href="http://heartbeetkitchen.com/2015/recipes/type/dessert/salty-chocolate-date-caramels/"]this recipe[/url] via Heartbeet Kitchen. In the bowl of a high powered blender or food processor, combine the dates, ginger, lime zest, almond butter, rum, vanilla bean seeds and salt. Process until it all comes together into a thick, sticky paste. Add the almond meal and process further just until everything comes together. Line a baking sheet with parchment paper. Scrape the date caramel out of your blender / food processor onto the parchment lined baking sheet. Using a rubber spatula, spread the caramel out into a smooth rectangle about 1" thick. Pop the caramel into the freezer for 30 minutes up to an hour. Once the caramel is set, remove it from the freezer. Lightly coat the blade of a sharp knife with oil (I use coconut oil) and slice the caramel into shapes as you like. I do 2" x 2" squares. Set each caramel onto a fork and dip / coat each caramel in melted chocolate. Tap the fork against the edge of the bowl to remove excess chocolate. Slide each coated caramel back onto your parchment paper. As you work, top each enrobed caramel with fresh ginger or lime zest before the chocolate has hardened. Continue until all of the caramels are coated & adorned. If you temper your chocolate, the caramels last for up to a week at room temperature. Otherwise, keep them stored in your freezer until ready to eat. *If you don't have a double boiler or bain marie, you can melt chocolate in a metal bowl set over a pot of boiling water. Just do your best to keep water out of the chocolate.